Blue Tansy Essential Oil offers relief from skin inflammation. It helps to protect against bacterial infection and in lowering histamine levels, thus controlling allergic reactions, providing stress relief, and relief for anxiety and depression. Caution: Contains high level of Thujone which is poisonus therefore must only be used in low dosage. Do not ingest. Essential oils should not be used directly onto skin, therefore Finesse recommends using a carrier oil of your choice, or their wonderful massage oil (a beautiful blend of Sunflower, Wheatgerm, Sweet Almond and Vitamin E oils). Simply add few drops essential oil to 20ml of massage oil before using on skin. Alternatively infuse your oils in a vaporiser/diffuser by adding few drops to the water every few hours. Don't forget if you have a ceramic or glass fragrance warmer you can add your essential oil to warm water and heat whether electric or t-lite. If using in the bath add to carrier oil (a few drops into 1 tsp.) and run under faucet and enjoy. 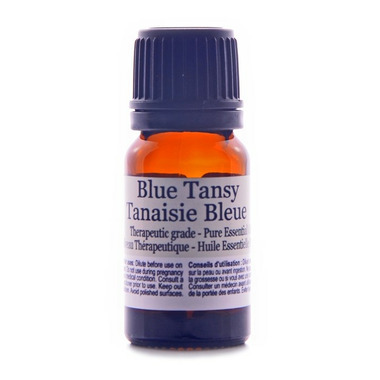 This Finesse blue Tansy/chamomile oil is fantastic - particularly for skin related issues (very similar to what is used in the Herbivore products bearing the same name). If you order this product, you can DIY your own fantastic skin blends!